Add the data after the indicated node. Add the data to the start of the list. Add the data to the end of the list. Create a new list using mem_alloc. 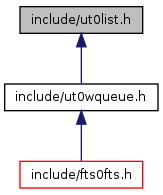 Lists created with this function must be freed with ib_list_free. Create a new list using the given heap. ib_list_free MUST NOT BE CALLED for lists created with this function. Get the first node in the list. Get the last node in the list.